If you are having trouble getting your child to sleep, this may be the right book for you: 5 Days to a Perfect Night's Sleep for Your Child: The Secrets to Making Bedtime a Dream by Eduard Estivill. I will admit--the last couple months have been very trying, with a baby who wouldn't sleep. When my son was a baby, he fell asleep by himself quite easily--he'd cry for five or six minutes before falling asleep for the night. My daughter was not so cooperative. She'd cry for hours and hours until we'd go in and pick her up. Then she'd wake again at 2 in the morning and wouldn't stop crying. I rushed to the library to get a book on teaching good sleep habits. The first book I got (whose title I won't mention) advised me to sing to my daughter for an hour or more before putting her to sleep. So I turned off the light, sang to her for an hour every night, and tried to get her to sleep. Singing for an hour plus every night is not fun, karaoke or not. I was able to use this method to get her to sleep the first time in the night, but when she woke up at 2, she wouldn't go back to sleep. I was getting two two-hour naps a day instead of real sleep. It was brutal. Eduard Estivill's book helped me get back to a normal cycle. It's a really short book (can be read in one sitting), and I don't want to give away too much of his secrets (he should get paid for this wonderful gift he's shared with the world), but his philosophy in a nutshell is this--sleeping is like eating: it's a learned skill, and it needs to be taught. Most parents approach sleeping as a punishment or as a voluntary activity. Instead, they should think of teaching their kids to sleep, by being firm, confident, and authoritative. Estivill says not to sing, not to coddle, only to tell your daughter that she needs to sleep. He has a chart that lists intervals that a parent should re-enter the child's room when teaching sleep. As Estivill warned, it was hard on this dad for the first couple nights, but we're on our seventh night, and it's worked really well. Baby Pod still doesn't sleep right away, but she now sleeps through the night, and she does a much better job of putting herself to sleep. I've noticed that with the extra sleep ("extra" meaning going from 4hours a night to eleven), she's a lot happier, more energetic, and generally healthier. 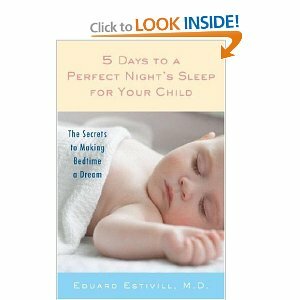 If you are desperate to getting your child to sleep better, I'd highly recommend Estivill's book. Check it out. My eldest says to my youngest: You can’t do that! He doesn’t have that power! My youngest responds: We can pretend he does. My eldest responds: That’s silly then it wouldn’t be real! Don’t be silly! You can’t be a writer! Chinese aren’t writers! Be an accountant! Don’t be stupid! You can’t be a baseball player! Chinese aren’t baseball players! Be smart! Be a lawyer! I worked hard to instill “possibility” in my children. So where did I fail? When did they move onto the Isle of Can’t? Two of my favorite holiday movies are Miracle on 34th Street and Bass and Rankin’s The Year Without a Santa Claus because they address issues of the imagination - What we tell our children they are too old to do anymore. In parenting, because I believe we would rather be safe than sorry, our kids hit a certain age and it seems the very same make believe world that made them adorable makes them frustrating, impractical, and possibly impossible. Somewhere along the course of our maturity, we devalued a vivid imagination. My favorite example of the power of a great imagination is the Wright Brothers, who without formal scientific training did what the many experts in their time could not – or worse believed was impossible! They flew. Something we take for granted today. I think this time of year in particular it is important to cherish a really good imagination. In this season it’s easy to get lost at the store or the mall. So many people you need to buy for. It’s easy to confuse what’s really valuable about getting together for the holidays. Imagining John Lennon was never shot is a good thing – Imagining nobody getting shot is even better - But Beech’s imagination belittles John for choosing fatherhood over the music business. On the sugary “Double Fantasy” LP, he told his son Sean “I can hardly wait to see you come of age,” a line now heavy with irony -- at the time just cringe-worthy. The best hope is that some headline or another would have shaken Lennon’s complacency and fueled feverish bursts of music. I am reminded of something I heard Jessica Hagedorn say years ago when asked how motherhood had impacted her writing. I forget the exactly how the question was phrased. However, I remember how she replied. She said it made her much more conscious of time and how she spent it. It made practical sense back then when I was single and childless. Now a parent myself still wanting to pursue my own writing her statement becomes much more meaningful. A good friend reminded me when I bemoaned self-pityingly about how I’ve let my own artistic pursuits fall to the wayside that being a good dad is probably the most challenging but definitely the most rewarding artistic pursuit. And I’ve come to learn just how right she was. I haven’t felt anything as exhilarating as when my children take my hand. Beech is right. John might have fallen out of the public light. But he is wrong in assuming that John would have given up his writing and his music. Fatherhood changed the paradigm I use to assign value to things - including the grudges I keep and those I abandon. I imagine it would have done the same for John. Holding my children’s hand to cross the street or staying up with them when they’re sick gives life new perspective and meaning. I know Sean isn’t his first child but his life as father to Sean and his life as father to Julian are quite different. The main difference being he was older and more experienced when Sean was born. So I concede to Beech that John had “mellowed” at the time of his death. Most enticing was the prospect of a Beatles reunion. Paul McCartney, carrying a guitar, showed up at the Dakota during Lennon’s “househusband” years and was turned away. John was baking bread and looking after the baby. Like Beech it’s easy for me to imagine John as a “househusband” but in my scenario he doesn’t turn Paul away. He invites this very important person from his past in and they bake together and play a song for the baby afterwards. They talk about the past, the chores of the present, and the potential in the future. I imagine John drawing from the best interpreted influences – European, American, and Asian. I imagine he would have pioneered the current real world social trend of empowered Stay-At-Home dads. Just a dad celebrating time with his son. It’s that time of year already, and its been a while since I’ve blogged about my favorite rice daddy topic: great food! After all, nothing connects you to a culture more than eating your way through it. Also, an old high school friend recently emailed me for a recipe (hi JS), so I thought this would be the best forum for sharing it. 4-8 oz glass noodles, soaked to soften, then drained, and very coarsely chopped. Salt, garlic salt, pepper, soy sauce to taste. 1. Sauté the pork & shrimp together until both are cooked, drain the liquid. 2. Sauté the napa cabbage and mushroom until the cabbage is cooked. Press out ALL the liquid. 3. Toss together the meats, veggies, glass noodles. Drain any remaining liquid. 4. Season to taste. I use about 1t salt, 1t soy, 1/2t pepper. 5. Wrap em up, fry em up, eat em up! I like mine with sambal olek & soy, or mustard! 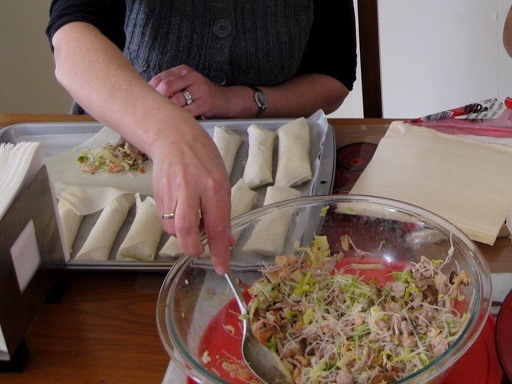 Note: draining the filling is crucial, otherwise the eggrolls will leak and come apart while frying. Alright, get your holiday eats on, everybody! And, please, if you've got some holiday recipes that would make my grandmother jealous, let me know, I'm hungry already!